The diabetes diary allows you to complete the picture and provide your diabetes team with relevant information in addition to the blood glucose values to help improve your diabetes therapy. With the Accu-Chek Smart Pix software you can mark your blood glucose value as pre- or post-meal, or as having measured before, during or after exercise to better understand the effect of food and exercise on your blood glucose levels. 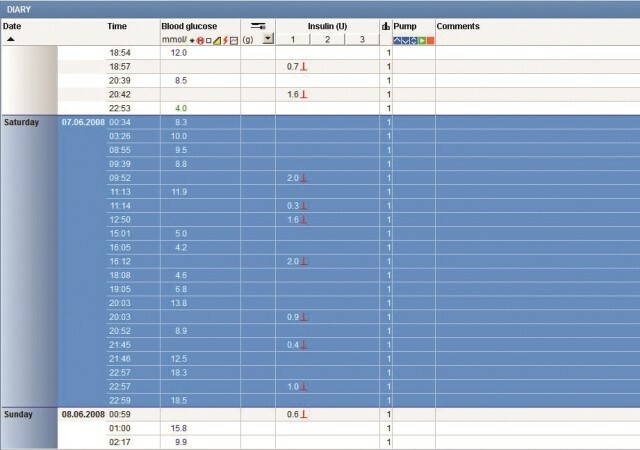 It also allows you to add insulin and carbohydrate values for a cause and effect analysis of your blood glucose levels. This information can help you to better understand the dynamics of your blood glucose fluctuations and further improve the management of your diabetes.